Perched above Rapid 17 on the very edge of the Batoka Gorge, Taita Falcon offers superb views of the raging Zambezi waters 200m below. Taita Falcon Lodge offers its guests the height of luxury set amidst the natural bush environment of the Batoka Gorge. A unique departure from the typical hotel style, the Lodge's focus is on quality personal service, uncompromising comfort and providing guests with an unforgettable African experience. Owner managed, the flexibility of your hosts and their willingness to accommodate the wishes of each individual guest, ensures a special home-from-home experience for every guest. Taita Falcon's accommodation consists of seven spacious chalets with large en-suite bathrooms. The exterior of the chalets is constructed of natural materials and the entire place has a 'close-to-nature' feel about it. The walls are made of reeds that come up to eye level - creating just the right balance between privacy and 'freedom'. Of the seven chalets, three can be converted into family rooms sleeping up to 5 people, while the remaining four can be made up as double, twin or triple rooms. The mosquito nets hang from frames connected to the wooden beams in the roof, and extra ones (for families) can easily be added. They also have repellent coils in the rooms to make your nights as peaceful as possible. During the colder winter months hot water bottles are placed in the beds to make them warm and cosy. Each room has a little sitting area with beautiful wooden furniture. The beds are also made of wood and each chalet is a little bit different compared to its neighbour - making it more personal. The rooms are partially open and extremely beautiful. All the furniture is made of wood and other natural materials, and the rooms have a fresh feel to them. The bathrooms are also very unique with stonework basins and showers. Some of the chalets even have outdoor showers in their private gardens. A tour of the magnificent Victoria Falls and surrounding rainforests. A sunset cruise on the upper Zambezi alongside the Mosi-oa-Tunya National Park. 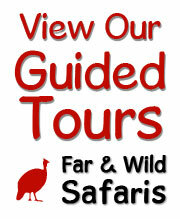 Livingstone Tour - including Museum entry and market tour. A locally guided tour of our neighbouring traditional village where tourism has not affected the day to day lives of the people - an opportunity to experience tribal life in Africa. Game drives to see Zambia's only rhino, amongst other game. Bush and bird walks from one and a half hours. Taita Falcon is an ideal destination for honeymooners with special attention paid to the 'romance of the bush'. Specialities include taking a romantic dinner in your private garden, champagne on arrival, or any special requests you might have. As the Lodge is small and exclusive, individual needs are easily catered for! Small private weddings with a "bush theme" can be arranged at the Lodge with a legal celebrant presiding. Since one of the owners was married there himself, they are experts at making your day wonderful. The gardens are a colourful blend of indigenous plants and are a bird watcher's paradise with over 210 birds identified including, of course, the rare Taita Falcon. Taita Falcon Lodge is located on the Zambian side of the Zambezi River, 11km downstream from the Victoria Falls and approximately 20km from Livingstone.